UV-C Air Purifers, Surface Disinfection, Ozone . Use of UVC for Home or Office Air Purification & Surface Sterilization as well reasons Ozone producing Purifiers are not recommended. Although most of the posts/articles in this weblog are aimed at Aquarium and Pond use of UV Sterilization/Purification, I think some time should be spent on another application for UVC radiation, especially with the onset of Flu season (including the H1N1 flu virus; AKA “the Swine Flu”). Hospitals have been employing UVC air purification systems for years do to their effectiveness in checking the spread of air borne pathogens. Another pathogen generally spread by air is Tuberculosis; a person with Tuberculosis (TB) of the lungs or larynx can release droplets containing Mycobacterium tuberculosis into the air by coughing, sneezing, talking, or breathing. These droplets, called droplet nuclei, can cause TB infection if inhaled by anyone who shares air with the person who has Tuberculosis. 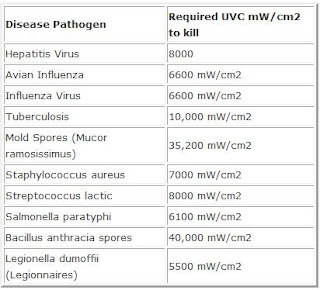 The influenza virus is actually one of the more easily destroyed pathogens by UV Radiation with only 6600 mW/cm2 required to kill this virus. Put simply, a 9 Watt UV bulb can kill this virus with an exposure time of 5.68 seconds. This makes for a very simple way of destroying many harmful pathogens in the home or office with an air purifier equipped with UVC bulbs. This list is far from a complete list, as it is only intended to convey what the addition of UVC to an air (or even water) purification system can do for your home or office. Generally most new Air Purifiers use non-ozone producing UVC bulbs; in fact the State of California has banned ozone producing air purifiers. However I should note that many air purifier manufacturers have switched to non-ozone producing UV bulbs (the aquarium/pond UV manufacturers have used non ozone producing UV bulbs as long as I have been in the industry). So if your air purifier is on the list of potentially hazardous units, chances are it is no longer is using ozone producing UVC bulbs. If you have an older unit (such as older Bio-Zone, King Air, Eco-Quest & many others) that may employ the ozone producing bulbs, I would suggest simply switching these bulbs out with a new non ozone producing UV Bulb. I would add as to ozone production and some of the negative reviews of some air purifiers; these reviews are all old and based on models that used ozone producing UV Bulbs from what I have read. My thought is that these headaches some complained of were due to ozone production. Headaches cannot be caused by contained non-ozone UVC purifiers. Sadly many replacement bulb sellers or even purifier manufacturers still sell ozone producing UV-C Lamps, even many consumers strangely demand these UV-C Ozone producing bulbs (to me this is like demanding the sale of carbon monoxide suicide machines for ones home?). "Please Note: This air cleaner does not meet California requirements and cannot be shipped to California.". If this does not speak volumes, I do not know what does! The two most common types are the stand alone air purifier that employs UVC radiation in a shielded area of the unit or the in-Duct UV Air purifier that fits simply into most home or office air or ventilation systems. The Sharper Image Ionic Breeze Air Purifier (pictured at the top of this article) has been around for some time, and employs a common 15 watt T8 UV bulb, however this unit has mixed reviews from many. 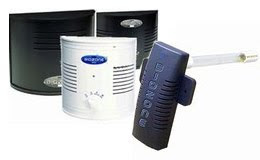 Bio zone makes several popular models of stand alone air purifiers and in duct air purifiers (pictured to the left). Popular models include the 1000, 2000, & 3000 Air Purifiers along with the 1500 and 2500 in duct purifiers. 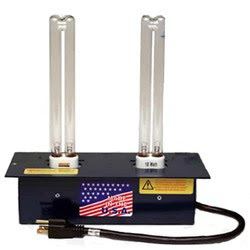 Most Bio zone products employ a T5 10 Watt UV Bulb. Another popular air purifier is the CaluTech “Blue” and Mini in-duct air purifiers. These in duct purifiers are simple to install and the three most popular models employ either the 18 Watt Twin Tube UV bulb (Mini), the 36 Watt Twin Tube UV bulb (original “Blue”), or the 55 Watt Twin Tube UV bulb (Blueray Super Output UV Air Purifier). 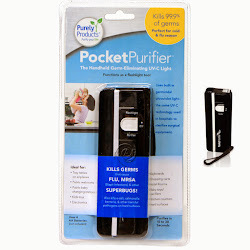 Another device growing in popularity for home (& restaurant too) is the "Pocket Purifier"
The Purely Pocket Purifier has a built-in UVC light bulb (lamp) that when turned on and exposed to surface areas or items needing to be disinfected/purified, will destroy the germs and bacteria killing their DNA, and preventing them from reproducing and growing. The information provided in the article has been very useful . we do need to be more considerate of our environment. Very interesting information in your post. It is imperative with all the things floating in the air that we do what we can to purifier as much of the air we breath as we can. You can see almost immediately the impact fo poor oxygen quality in fish, but it takes a little longer to show up in humans. Thanks for your blog. I really appreciate the info you've collected. This article fails to mention that most UVC air purifiers are ineffective due to the low exposure time to the UV. You happen to mention the influenza virus being one of the easiest to kill with an exposure time of 6 seconds required to destroy it with a 9 watt bulb. But how long is the air exposed to UV in most purifiers? I would guess air is inside my purifier for about .1 second on the low speed setting, and a smaller fraction on higher settings. Try waving your hand to generate a small breeze. anything less than 1 meter per second produces next to no discernible air movement. Now consider the path for the air purifier being far less than 1 meter, and the UV chamber being about 5cm. Various health organizations are also now stating this problem with UVC air purifiers. Great article on aquarium vs. pond uv sterilizers. A good air purifier can help keep you and your family healthy and can also fight against allergies. Allergies are caused by tiny particles called allergens. You can’t have an allergenic reaction if there’s none of those in the air. Excellent site as well as excellent polluting of the environment subject too. All of us perform have to be much more thoughtful in our atmosphere. The info supplied within the post may be very helpful. Thanks for sharing this informative post. Thanks for the article. Air quality has always been a concern in my household. I have a sibling who suffers from asthma and sensitive skin, so I have learned that an air purifier is absolutely essential in my home. I'm constantly searching for the best air purifiers as well as the best water purifiers.